As much as I like to admit that I'm a creature of habit, meaning that I'm particularly drawn towards any shoes with a heel or wedge, being a college student has been sort of a game changer in that department. I'm currently taking summer classes at UNC-Chapel Hill and the walk to class is literally up two hills every morning. Walking all over campus requires comfy, flat shoes, and if I'm going to wear something flat, it better be chic... right? 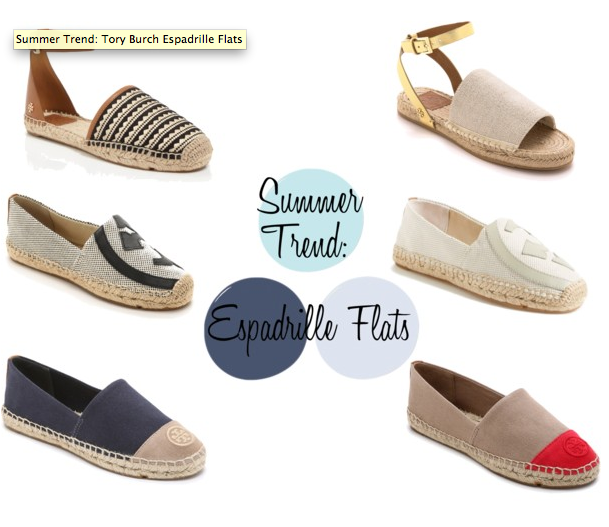 I'm loving the espadrille flats for summer because they can easily polish up a simple look. You can also find more Tory Burch Espadrille Flats options here. Also loving these espadrille wedge sandals here + here. Maybe flat sandals are just good for the sole. HA. #ihadto What's your favorite pair? I LOVE the gold strappy espadrilles. The nice thing about them is that they have a more polished than casual vibe. Considering you are a heels enthusiast that's probably more in your court?